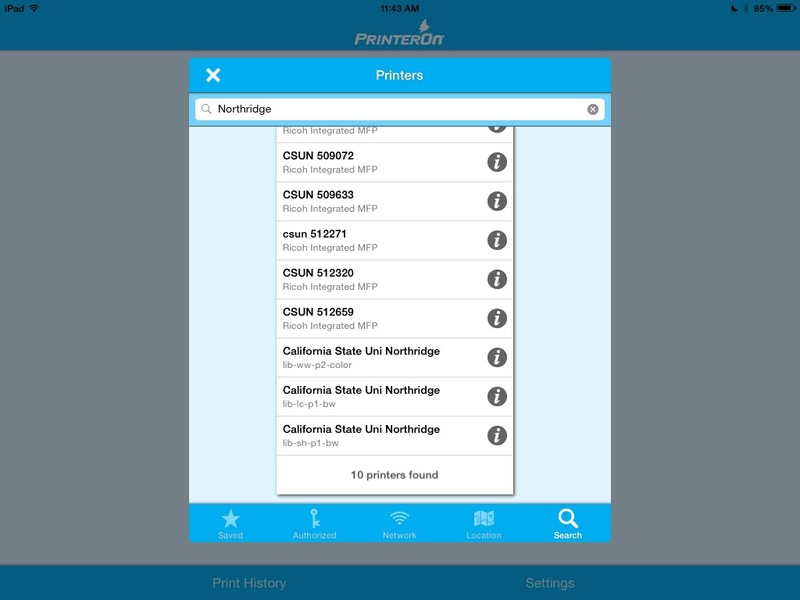 CSUN students, faculty and staff can print through Lab Printing @ CSUN. Lab Printing @ CSUN is available on all public computer stations in the Oviatt library. PLEASE NOTE: DOUBLE-SIDED PRINTING is the DEFAULT MODE, in order to SAVE MONEY and SAVE PAPER. You will need to manually adjust the print properties in order to print single-sided. Single-sided printing is 3¢ per page additional charge. Enrolled CSUN students are given $10 Free Student Print Funds at the beginning of the semester. If you spend all your free student print funds, you can go to an Account Station to add value using Cashnet. Account stations are adjacent to each printer. You must use a Debit/Credit Card to add printing funds. Students, faculty and staff can print to all Library Lab printers from wireless devices through PrinterOn. Go to the Wireless Lab Printing @ CSUN website. Sign in with your CSUN Portal login to print. File types supported: MS Word, MS Office, MS PowerPoint, PDF, JPEG, GIF, PNG, TXT, OpenOffice formats. If you encounter any printing issues please submit a support request form at http://www.csun.edu/lab-printing-support. You can also get support from the Library Technology Services office on the 1st floor or by calling 818-677-6304. Photocopy machines are available on all floors of the Library. All utilize a value-added print/copy card, and some offer cash/coin operation. Copies are 10 cents each with a print/copy card and 20 cents each with cash/coin. Insert $1 to purchase a new card. Change for card vending machines is available at the Library Fines window on the 1st floor, next the Guest Services desk. Go to the Visitor Computing and Printing webpage for information. Faxing is unavailable in the Library, but is available at QuickCopies and Reprographics, in the Matador Bookstore Complex. Problems should be reported to the Library Technology Services office, or by calling 818-677-6304.